In 1960, Eberhard Fischer had the opportunity to accompany his father, the art ethnologist Hans Himmelheber, on a major expedition to West Africa. 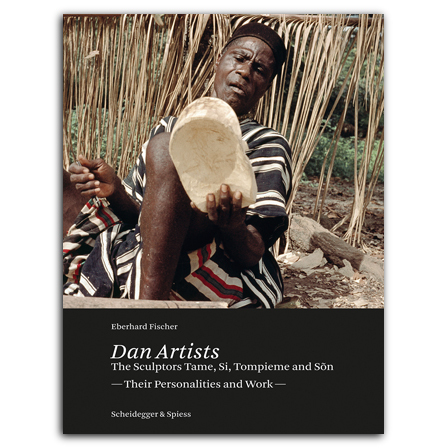 He was actually only meant to film the Dan mask carvers as they worked, as well as their festive performances. Yet the strong personalities of these sculptors impressed the young man deeply and he began to document their life stories, record their artistic work methods in detail, and also to collect their works. The biographies and many of the photographs shown in the book of four mask carvers from the Liberian hinterland are unique in the study of African art, as masks are carved in secret in many of these cultures. Until recently, the works were recognized by art ethnologists and collectors, but rarely the people who created them. The new book presents Fischer’s essay, originally published in German in 1963, for the first time in English. For the new edition the text is supplemented by additional images and an epilog. A DVD with the historic film recordings of the artists at work rounds out the book. , born 1941, studied ethnology, early history, and comparative theology. He has been director of Museum Rietberg Zürich 1972–98. He is an expert of West African art and has published widely and realized numerous exhibitions on the subject.